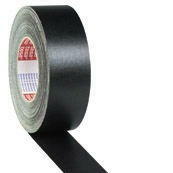 As official suppliers of Tesa Tape to the motorsport industry we are able to supply 4651 in a variety of colours, all of which are priced at £26.50 per roll. Alternative colous available are: White, grey, red, blue, green and yellow. The product listed here for purchase is black. Should you require a different colour simply email us after making this purchase and your chosen colour will be supplied. We offer a fast and efficient delivery service priced at £4.50 for one roll and £9.50 for two rolls or more.